On paper, the Dana Hills boys volleyball team does not stack up well against the height of most of their opponents. But the team does not let that slow them down. 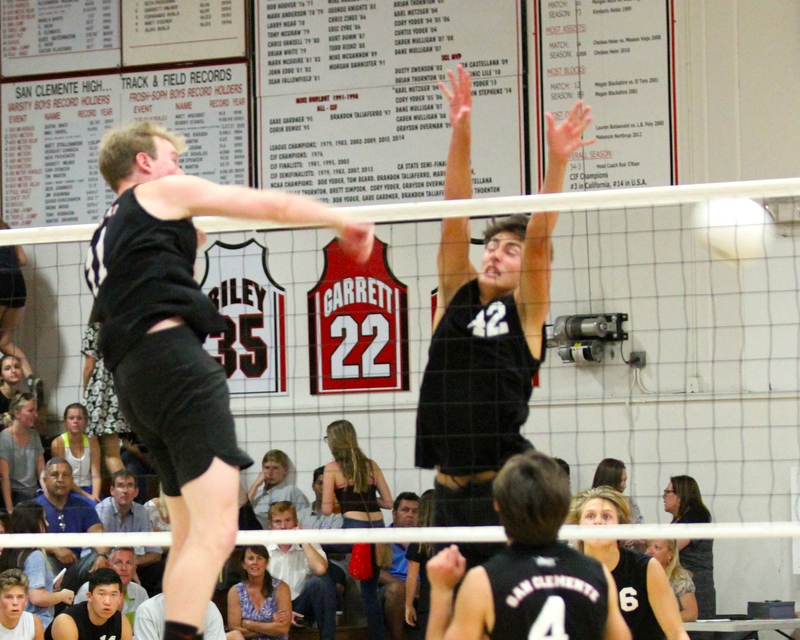 Dana Hills faced a much taller opponent in San Clemente on April 28 at the Tritons home gym and used their ball control-oriented style of play to sweep their longtime rival, 25 -23, 25-19 and 25-20, to claim the South Coast League title. The Dolphins (22-1, 7-0 league) excelled in just about every facet of the game, especially when serving and passing in transition, according to head coach Oz Simmons. “We have to be the better passing team if you’re going up against guys who are 6’8”, 6’6” and I think we did. We passed and served probably the best that we have so far this year,” Simmons said. Senior outside hitters Grady Yould and Teddy Fitzgerald led the Dolphins. Fitzgerald collected a game-high 13 kills and Yould added 12. The two combined for at least nine points in every set and were responsible for Dana Hills’ first six points in the third and final set. The Dolphins had eight aces from six different players. The final point of the match came on a Thomas DeStefano ace that secured the outright league title. San Clemente (17-4, 4-2) was down 16-8 in the first before mounting a late comeback. Two straight kills by junior Aaron Strange brought the Tritons to within one point at 24-23, but Fitzgerald ended the threat, and the set, with a kill on the first play out of a Dolphins timeout. The Tritons erased a seven-point deficit in the second and trailed Dana Hills 20-18, but consecutive serving errors on their next two tries handed the Dolphins the set. Dana Hills has now won nine straight matches and has dropped only one set in seven league tilts. The second-place Tritons will travel to play Laguna Hills on April 30 and host Tesoro on May 5.